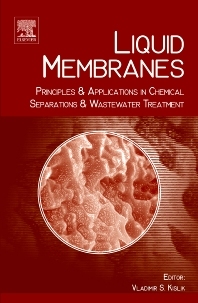 Liquid Membranes: Principles and Applications in Chemical Separations and Wastewater Treatment discusses the principles and applications of the liquid membrane (LM) separation processes in organic and inorganic chemistry, analytical chemistry, biochemistry, biomedical engineering, gas separation, and wastewater treatment. It presents updated, useful, and systematized information on new LM separation technologies, along with new developments in the field. It provides an overview of LMs and LM processes, and it examines the mechanisms and kinetics of carrier-facilitated transport through LMs. It also discusses active transport, driven by oxidation-reduction, catalytic, and bioconversion reactions on the LM interfaces; modifications of supported LMs; bulk aqueous hybrid LM processes with water-soluble carriers; emulsion LMs and their applications; and progress in LM science and engineering. This book will be of value to students and young researchers who are new to separation science and technology, as well as to scientists and engineers involved in the research and development of separation technologies, LM separations, and membrane reactors. Provides comprehensive knowledge-based information on the principles and applications of a variety of liquid membrane separation processes. - Contains a critical analysis of new technologies published in the last 15 years.